Home » england , great britain , history , magna carta » Magna Carta: 800 and counting! Magna Carta: 800 and counting! Worth noting that we are currently in the midst of the eighth-hundred anniversary of Magna Carta: the founding document of English law and a cornerstone of liberty for many nations down through the ages. Including the United States. Ahhh yes: John, King of England. A monarch so disastrously bad that not once since and never again has England put a king named "John" on the throne. He spent years wrecking havoc on the country he was supposed to be leading (sort-of like the past three or four presidential administrations here), wasting money and manpower and countless lives on wars in France and such. Finally, enough was enough. A bunch of the barons of England decided that the time had come to lay the smack down on King John. So they showed up in force, arrayed in their armor and finest weaponry and, ahem... "invited" John to come down to a meadow at Runnymede near Windsor. Because they had a list of demands and if he knew what was good for him, he was going to read it and sign it. The document which would come to be called Magna Carta ("Great Charter" in Latin, because of its large size compared to other documents of the era) curtailed the powers of the king so as to assert the rights of the barons, delineated individual rights such as jury trial and fair justice, and laid down the groundwork for what would become parliamentary law. John looked around at all of those armored barons and their retainers and quickly arrived at the conclusion that Runnymede was not the place to get all uppity. With all the barons witnessing, he signed the Magna Carta on June 10th, 1215. A few days later on June 15th the barons pledged fealty, which is kind of a way of saying that the Magna Carta was officially ratified. It was all well and good, but pretty soon neither party really upheld their terms of the agreement. 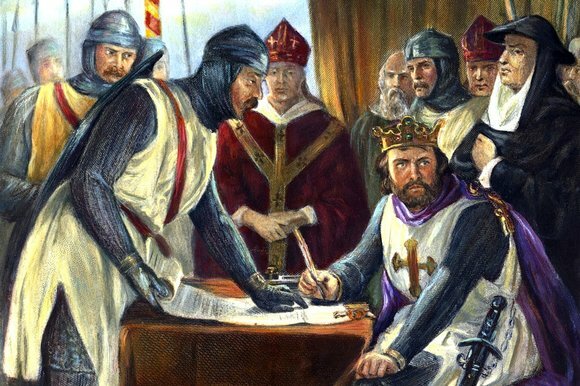 Magna Carta went for awhile annulled by the pope, but after a bit of a civil war and the coming to the throne of Henry III it became the consensus of most that the treaty was a pretty good idea after all. From that point on, it's remained one of the basic elements of English law. And consequently, a progenitor of the Declaration of Independence in the United States. So, happy birthday to Magna Carta! Looking not too shabby for something eight centuries old.